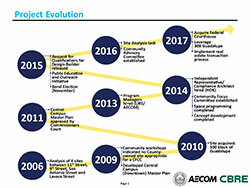 In 2009, a Central Campus Needs Assessment was initiated by Travis County to understand what space would be required to house the staff and services needed to adequately serve County residents from 2009 to 2035. Community workshops and additional research indicated that the County did not own a site appropriate to respond to the current and forecasted demands for the existing civil and family justice system. In 2010, the County purchased the “Original Court House and Jail Block,” located at 308 Guadalupe Street, an approximately 1.8-acre city block bounded by 3rd and 4th Streets to the south and north, respectively, Guadalupe Street to the east and San Antonio Street to the west. In 2013, a Program Manager and an Independent Representative/Compliance Architect were hired to lead development of the concept and cost estimate for a new Civil and Family Courts Complex (“CFCC”) in preparation for a bond election in 2015. The bond proposition was narrowly defeated in a November 2015 election. In response, the Commissioners Court acted to leverage the high-value site for maximum financial return to support an alternative solution at another location to accommodate the ever growing and pressing space needs of the civil and family justice system. In 2016, the Commissioners Court embarked on a multi-faceted approach to address the space needs for the civil and family justice system. The approach consisted of: (1) Offering the 308 Guadalupe Street site for sale and/or lease to leverage its financial value; (2) Acquiring the historic federal courthouse located at 200 West 8th Street through a grant from the Federal Government; (3) Conducting a county-wide comprehensive site search for a new location to construct a new civil and family courts facility; and (4) Identifying potential strategies to reduce the overall cost of a new courts facility. To date, the County has made significant progress on this multi-faceted approach. In December 2016, the County was awarded the Historic Federal Courthouse from the federal government and will soon begin renovating it to house the County’s probate courts in an effort to alleviate near-term pressure on the existing Travis County Courthouse. In July 2017, the Commissioners Court executed a 99-year ground lease for the 308 Guadalupe Street site, which results in $430 million in value to the County and its residents over the 99-year term of the lease. The County and their consultants worked throughout 2016 and 2017 in consultation with a Citizens Advisory Committee (CAC) to complete a site search for a new location to construct a civil and family courts facility while also identifying significant project cost reduction strategies. Over 40 parcels of land, located throughout the County were evaluated and five alternatives were identified for further detailed evaluation. Construction site constraints, potential massing studies, conceptual level cost estimates and anticipated milestone schedules were developed for the five remaining alternatives. Upon completion of the detailed evaluation, the CAC deliberated on each alternative and ranked them accordingly. The CAC recommended that the Commissioners Court negotiate terms with the landowner(s) of the preferred site. The discussions and options explored during the negotiations uncovered significant potential to execute the new courts facility project more quickly and at a lower cost through a build-to-suit real estate transaction, rather than through the purchase of land and a separate and subsequent design - build process. The project team and CAC had not considered this delivery method during the site selection process, which focused exclusively on location and land acquisition. Based on the feedback received during this process, the County made the decision to pivot its approach and consider the feasibility of a one-step, build-to-suit, land and building acquisition strategy in an effort to deliver the project more quickly and cost effectively. Given this change in strategy, the County felt it was important to re-open the door to all potential proposers to develop and deliver a new courts facility on an appropriate site within the County. To determine the viability of this strategy, the County issued a Request for Industry Comments (RFIC) in December 2017 to solicit feedback from industry experts. This RFIC indicated both interest in and viability of the strategy, and the County leveraged it to create the final Request for Proposals, which was released on February 23rd, 2018. Proposals were due and received on April 9, 2018. Staff worked for several weeks of evaluation and negotiating terms with respondents. On July 10, 2018, Travis County entered into exclusive negotiations with Hunt Companies at a site located at 1700 Guadalupe Street. Staff and the development team will now spend the next several months negotiating all aspects of the project to reach a mutually acceptable purchase price for the site and the facility. Travis County hopes to be ready to sign a Purchase and Sale Agreement (PSA) with the development team in March 2019.